I can't thank you enough for all your help to make my trip to Bhutan an amazing experience. You always responded to my (many) questions so quickly that it almost seemed that you really weren't half a world away. You were wonderful through all the changes that I and other sources through at you; through it all you planned the perfect itinerary. The guides were extremely knowledgeable, friendly and courteous; I feel I have made new friends with each and every one of them. The accommodations were outstanding everywhere and you were able to get me into all the special events I want to attend, with your guidance it really was the trip of a lifetime! Thank you for the most amazing trip to Tibet, Nepal and Bhutan, your itinerary was a very good one, well planned and had all the needed components: from spiritual, to culture, to accommodations and many others. Beyond all that your friendly and cooperative attitude made our trip an unforgettable one. Please pass our regards and thanks to all three companies in Tibet Nepal and Bhutan. Special thanks to yourself, and to Yontan in Bhutan and Lapka in Tibet. Hope we could meet in the near future again. My wife, son and I want to thank you for providing us with an excellent trip to Bhutan . Your company was very organized with all of the necessary plane and hotel reservations made well in advance of our trip. Your company arranged all the necessary Visas and the guides in each country were knowledgeable and helpful. My wife appreciated the Bhutanese guide's assistance in walking her safely down the steep hill from the Tiger's Nest monastery Thanks again. In February and March 2015, my wife and I were able to visit Bhutan. Our best tour trip was arranged with the assistance of Rajan and his company. We were extremely pleased with the accommodations, tours, guides and drivers which served us during this three-week holiday; and can highly recommend this company and its owner to anyone who is considering traveling in these beautiful countries. We also visited Nepal and Myanmar. Thanks again for everything. Our time in Bhutan was particularly enjoyable, perhaps partly by contrast with Delhi and Kathmandu. If all of the guides and drivers you employ in your company are of the same quality as Ngawang and Bhim then you must receive many critiques praising their performance. Bhim's skills as a driver were manifest any number of times from congested traffic in Thimpu to the rugged road between Thimpu and Punakha. He also has good English and a sense of humor. We felt very secure in his car. Ngawang is a perfect blend of calm (perhaps even serene) and knowledge. He patiently explained and reexplained some very difficult (for us) aspects of life in Bhutan and Buddhism. He was flexible (we wanted to skip the Paro Dzong) as you said he would be. Highlights of our time in Bhutan had to be our hike to the Taktshang Monastery and the meal we had on the last evening with the rice farming family. I don't know if it was coincidental, but we had commented earlier that we were tiring of continental cuisine for seemingly every lunch and dinner. This entirely Bhutanese meal was a perfect way to end our visit. All hotels were excellent. We especially enjoyed the view from the veranda of our hotel in Punakha. In short, not much to complain about. 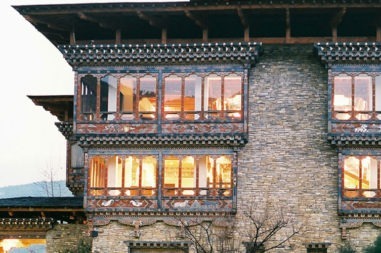 We will certainly be recommending the "Bhutan experience" and your company to our friends. We have come back last Sunday from and exciting and an adventurous trip to your country. It was exciting climbing and trekking those mountains .We stayed at some decent hotels, however the food was average. The guide and the driver you provided were excellent. Nawang was a font of knowledge , both local and international, the driver Jeevan was very good and careful, and he made the journey very comfortable.We enjoyed all the sights we visited and every day we looked forward to a ne destination. The downside to the trip was the condition of the roads, I understand that the Government has undertaken the road widening project from Thimphu to Bumthang . We found it extremely tiring because of the many bad road conditions on the way.Bhutan is unspoilt and we would visit again.The whole experience was well worth the visit. Many thanks for organizing such a wonderful tour for us. This will remain our unforgettable trip! We felt so lucky that we were able to visit your beautiful country during the 30th Anniversary of the Establishment of Diplomatic Relations between Bhutan and Japan. 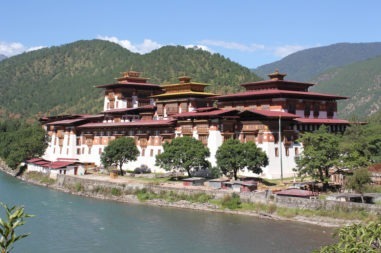 We spent one night in Thimphu, two nights in Phunakha, and two nights in Paro. Phunaka's Lobesa hotel became one of the most impressive splendid hotels we have ever stayed! Its view from the window was just gorgeous and took our breath away. Nawang was a knowledgeable, kind and caring guide and we learned a lot about your beautiful country from him. Ugay was a safe driver and we felt so comfortable in the lovely Nissan four wheels. The tour was both very informative and fun. In addition, Nawang accommodated many of our requests and re-arranged the original schedule to our satisfaction. Going to the weekend market in Thimphu became one of the highlights of this tour for us ! We'd like to visit Bhutan again in the future and we will definitely ask you again to organize tour for us. Finally, we would like to thank Rajan for being such a friendly coordinator. Your responses were always so prompt!! ©2018, Raven Tours & treks and Himalaya Holiday Service. All rights reserved & may not be reproduced without our permission.